Construction has begun on a new four-road Train Modification Unit for upgrading 1992 Stock. 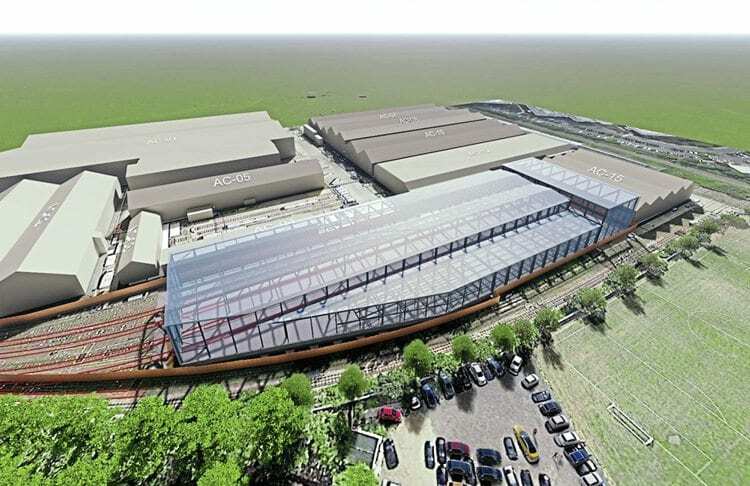 WORK has begun to build a new £23.3 million workshop at London Underground’s Acton Works, in West London. The 550sq m facility will initially host all 85 of the Central Line’s 1992 Tube stock fleet during their upgrade and refurbishment work, and is due to be ready to accept the first unit in April 2019 – although work is due to begin on the fleet two months before that. The construction works, contracted to a joint venture called Morgan Sindall BeMo, are to the rear of the buildings on the site of former sidings that were removed during 2017. The building will join others on the 13.4 hectare Acton Works site, which was established in 1922 as the main LU overhaul facility. The new workshop will contain four 160 metre pitted maintenance roads, as well as a bogie road for component works, and will create the capability to work on ‘walkthrough’ trains that does not exist at Acton. The 1992 Stock has served LU on both the Central and Waterloo & City lines since April and July 1993 respectively. The trains are now in the latter half of their working lives, being designed to last for 40 years, and are due for replacement in the New Tube for London project, otherwise known within LU as the Deep Tube Upgrade Programme (DTUP).